See Still Bill, then start here. The oeuvre of any good songwriter should improve with age. 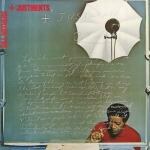 Non-causal listeners of Bill Withers can attest to the overall durability of +'Justments (1974), the last album Withers recorded for Sussex before signing with Columbia. Reel Music's re-release illuminates ten songs by Withers that are rarely included on the numerous compilations that cover his career. Sony, which owns Withers's Sussex catalog, often overlooks anything from +'Justments other than "The Same Love That Made Me Laugh", the highest charted single (#50) from the album. The shallow excavation of +'Justments is misleading, for there is certainly more than one track worth exploring. Withers is in fine voice on "Stories", accompanied by a stunning piano and harp arrangement. It's an immense pleasure to hear him sing as if he's standing on a mountaintop rather than gazing at his shoes. With James Gadson on drums, Melvin Dunlap on bass, and Withers on electric piano, "Heartbreak Road" lopes along with a tight rhythm and contagious melody. Strangely, the song is seldom accorded recognition on par with his more well known material. Similarly, "Can We Pretend" reaps numerous delights. Featuring Withers's double-tracked voice and José Feliciano on guitar, it is just about as perfect a song as Withers ever recorded. In the context of +'Justments, it atones for the distracting spoken-word introduction on "Liza" and the fact that "Railroad Man" chugs a bit too long on the track. Aside from Reel Music's excellent re-mastering, A. Scott Galloway serves up an historically sound essay. His interview with Bill Withers underscores the blunt, straightforward qualities that inform the artist's songwriting. "You", for example, cuts its target down to size with a riveting series of caustic statements and observations. "You're pouring muddy water on me trying to convince me it's rain", he snaps over a hypnotic groove. He's just as eloquently straightforward with his thoughts about the songs on +'Justments. Of course, his personality is magnified even more in the recent documentary Still Bill, titled after his 1972 album of the same name. That film offers a plethora of reasons to revisit Bill Withers. +'Justments is a fine place to start.